Your wedding cake consultation is an opportunity for you to discuss your ideas and inspiration for your wedding cake with your wedding cake designer. You should bring along any photos, colour swatches and anything else that gives you inspiration for your big day so that your designer can get a feel for your theme and the overall look and vision that you have for your wedding day. This will allow your wedding cake designer to create designs that fit seamlessly into your wedding and embodies the vision that you have for your big day. 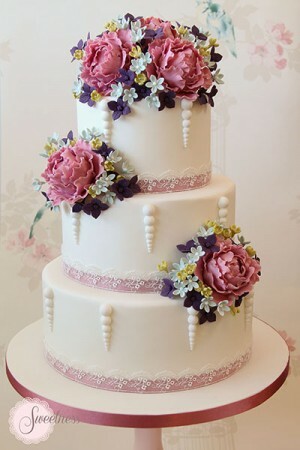 Will I get to taste the different cakes options in my wedding cake consultation? I strongly believe that you should always taste the cakes of any potential wedding cake designer you have interest in commissioning a cake from. I always give my clients a selection of our most popular flavours to taste in their initial cake tasting. All the flavours can then be tweaked according to personal taste. If a client would like something a bit different we are always happy to provide our couples with their hearts desire be it ginger and rum, red velvet and sticky toffee pudding to name a few. How may times do I meet with my wedding cake designer? 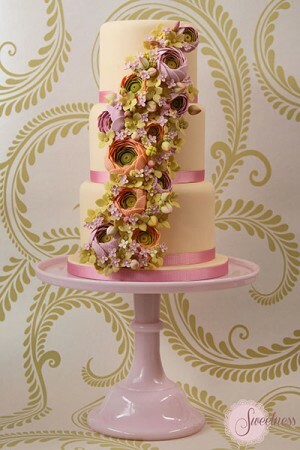 At Sweetness Cakes we meet with our clients as many times as it takes to finalise all the details of their wedding cake and confectionery such as the colour palette, flavours and fillings, sugar flowers or the piping detail. Usually it takes one to two meetings after the initial cake consultation to complete the design however we are happy to meet as many times as it takes to ensure our couples are one hundred percent happy with their wedding cake. Will you be able to deliver and set up the cake for me on the wedding day? 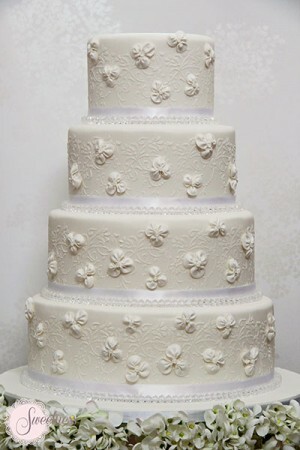 We do offer our clients a delivery and set up service for their wedding cake. If a client has a wedding planner who they are happy to set the cake up we arrange with that person to have it delivered to them at an agreed time. 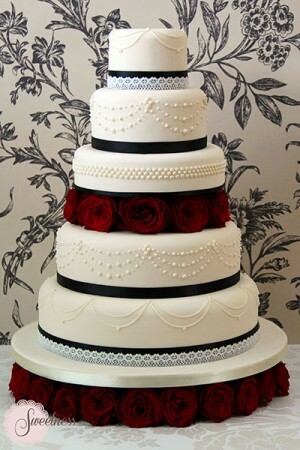 If however you would like us to set your wedding cake up for you at your venue we would be more than happy to do so. All of our cakes are packaged in heavy duty industrial standard boxes to ensure they are not damaged during transport. Very large wedding cakes that need to be assembled at the venue will have to be set up by us to ensure that the cake is put together properly and safely without any damage. Will I be able to rent a wedding cake stand from you? Sweetness Cakes offer a wide variety or cake stands and cupcake tower stands that can be rented out to you for your wedding day. We will advise you as to which stands are appropriate for your cake due to it’s diameter or due to the sheer weight of the cake. Sweetness Cake Boutique provides wedding cakes, cupcakes, mini cakes, iced cookies, fondant fancies and macaroons for weddings in London and the Greater London area. If you would like to book a no obligation, free of charge consultation with us please contact us and we will be happy to arrange it all for you.